Last year, Formula One left off with a chaotic but exhilarating race to finish the championship off nicely. Just four short months later, the sport is back with more of the same. The Australian Grand Prix kicked off the brand new season in style, with drama from the outset of qualifying to the very moment the chequered flag fell. Finally we got a chance to see how all the teams’ winter preparation has served them and who has made a great start to the new year. Not many drivers opted for a two-stop strategy during the Australian Grand Prix, with tyre degradation a top priority/concern throughout the weekend. 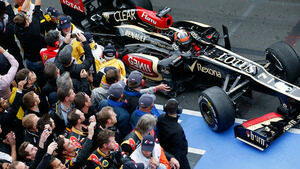 Kimi Räikkönen opted for the two stop plan, and it worked out well for the Lotus team. Qualifying was reasonable for the team, both drivers in the top ten, although nearer the lower end. Kimi out-qualified his teammate, and once the race began, he only ever moved forward. Afterwards, Kimi called it one of his easiest race victories, and described the latter stages of the event, where he could control the pace depending whether Fernando Alonso was catching him up or not. On the other side of the garage, Romain Grosjean lost places at the start and then found himself caught up in traffic often. The Frenchman has pondered whether there was something amiss with his car, particularly as tenth place is hardly comparable with the race win his teammate secured, even if they were on different strategies. Of course, the positive to be taken for Lotus on this front, is Romain getting past the first corner cleanly (as almost everyone did), and staying out of trouble throughout the race. We were a little deflated after qualifying, as we knew the car had better pace than our grid positions suggested. Nevertheless we were confident from the long run pace we'd seen on Friday that we could make a two-stop strategy work. Ferrari have approached the 2013 season with nothing less than optimism, particularly describing their new car as far ahead of where they were at this point last year. Alonso must have been quite disconcerted to see his teammate outqualify him on Sunday morning, and his helmet remained firmly on as they visited the weighing station once the session was over. The strategy during the race was firmly in Alonso's favour, as his second pit stop came earlier than perhaps originally scheduled. Some great pit stop work by the Ferrari crew saw the Spaniard get ahead of both his teammate and Sebastian Vettel, putting him firmly in contention for race victory. He chased down Räikkönen but had neither the pace nor the time remaining to make any difference. Massa admitted to being disappointed that he finished behind his teammate, but he lost no further positions from where he qualified which is in itself an achievement. We saw a car that started seventh and finished first, and a car that started fifth and finished second, so that means the situation of tyre management is crucial this year. But, if you are able to do that and be able to start on pole, it would be the perfect scenario. Red Bull were on top of the world first thing Sunday morning, locking out the front row of the Australian GP grid in a dominant display of speed and ability to manage difficult situations. It wasn't long before the strong starting position slipped away from them, however. Sebastian Vettel made his traditional dash off the line, immediately breaking the DRS and zipping away into the distance. However, within a few laps, the Ferrari duo were hauling him back in again, and suddenly it seemed they were not going to be as untouchable as feared. He lost out in the pit stops, but managed to keep hold of third place for a podium and a trophy. Webber had a terrible time of it. Not known for his great starts, the car was bogged down off the line, dropping Mark from 2nd down to 7th around the first few corners. He suffered yet more problems with KERS, and there was talk of issues in the pit stops as well. The team will no doubt be disappointed by dropping backwards from their front row lock-out, but a double points finish was the best damage control the defending champions could have achieved. Mercedes were under the spotlight this weekend, as all their high profile changes from the winter finally come together to start their championship campaign. There were a few mechanical gremlins that re-emerged during free practice, but the team seemed to get them under control. They showed good pace in qualifying, with both drivers getting through to the top ten, and Hamilton taking the third grid spot - best of the rest behind the blindingly quick Red Bulls. Unfortunately for Nico Rosberg, his sixth place grid slot was all for nothing, as he pulled off track after 27 laps with an electrical problem. He was visibly disappointed, heading through the paddock with his helmet on, not wanting to speak to anyone until feelings were under control. That left Lewis Hamilton with all the work to do, and although he dropped back to fifth place by race end, it was a reasonable effort for his first outing with Mercedes. Afterwards, he said it was above the team's own expectations, so if they can get two cars to the finish with this pace, they may be able to move onwards and upwards. Qualifying was pretty much what we would have expected from Force India. Sutil was still getting to grips with his return to Formula One, whilst Paul di Resta made it through to the top ten but couldn't make much more progress than that. During the race, the balance of power changed significantly, and Sutil offered up quite the surprise. Opting for a two-stop strategy, the German remained light on his tyres for as long as possible, watching everyone in front disappear into the pits until he was leading the race. For a while, it looked as though he might be able to remain in contention for a podium finish, but he had to put those supersoft tyres on eventually. Sutil dropped back to finish seventh, one place ahead of his teammate. Although Di Resta will no doubt have wanted to do better than Sutil on their first day back as teammates, it was all about the bigger picture and for the team it was a great start. A double points finish from two different strategies, and time spent leading the race to top it off. Paul was on the opposite strategy and finished just a fraction behind Adrian in the end. He probably could have passed Adrian in the closing laps, but he held station to ensure we brought home the strong team result. McLaren had what can only be described as a woeful start to the season - when compared to their own expectations, and their potential. The team are known for their ability to develop quickly and turn things around, and they're going to need to harness those skills for 2013. Almost from the start of the weekend, the drivers were opening up about the lack of pace the car. Qualifying was a disappointment, with Jenson Button admitting that securing tenth place on the grid during a wet session could have been the highlight of the weekend for the team. No one within the squad had confidence they could make progress in the dry. Pérez's first qualifying with McLaren was let down by a switch to dry tyres that came too early. Things did start to look up slightly in the race - it was dry, both drivers moved forward and both made it to the end. Pérez had a good start and fought his way to 11th, just missing out on points. Button brought home two points, but having won the race in 2012, it's not something he got excited about. The team have an awful lot of work to do, but they are aware of it and not scared of the challenge. Last year, Toro Rosso spent much of the time being anonymous and circling towards the rear of the grid with very little to write home about. This year, although their car doesn't seem to have improved radically, they still managed to raise eyebrows by setting the fastest lap of the race on Sunday, on several different occasions. The team were showing well in qualifying too, with Vergne in particular a contender for the top ten shoot-out. He has blamed the team for an early switch to dry tyres which proved to be the wrong decision, and he qualified 13th with his teammate one place behind. In the race, Vergne had a tricky start and also suffered some flat-spots when messing up an overtaking move, so his progress to 12th was not bad at all. Ricciardo was forced to retire with an exhaust issue, the car making it safely back to the pit lane but being pushed into the garage before the end of the race. Various disappointments for the team throughout the weekend, but some positives to take to Malaysia as well. The race weekend for Sauber promised plenty but failed to deliver for a variety of different reasons. Nico Hülkenberg just missed out on the top ten shootout and qualified 11th, but he was unable to start the race due to a fuel systems problem. The team opted not to run the car for safety reasons, which left Nico watching on from the sidelines. Rookie driver Esteban Gutiérrez was the highest placed new driver on Sunday, but that was after a very difficult Saturday. In the wet conditions, Gutiérrez spun the car right at the end of the first qualifying session, leaving his Sauber stranded across the track. He qualified 18th, and went into the race with the sole goal of getting to the finish. He crossed the line 13th, which showed good progress, but the team have a lot to think about as they move forward to Sepang. What is particularly bothering me is the fact that I lost all this mileage today, which is so important particularly at the beginning of the season. It would have given me a lot of valuable data and information for the next races. Rivalling McLaren for the team most disappointed by their pace during the Australian weekend was Williams. Where 2012 looked as though they were turning the corner and moving back up the grid, the team have taken a massive step backwards for the start of this season. Pastor Maldonado was outshone by his rookie teammate in qualifying, with Bottas getting through to Q2 and Pastor having to settle for 17th on the grid. During the race, Maldonado hit a damp kerb and spun off track, the Williams ending up beached in the gravel unable to continue. Bottas had a good start and put in a solid afternoon's work to finish 14th, a bit of a confidence boost for the Finn. The team later described their attempts at splitting the strategy, starting each driver on a different compound in the hopes of making progress, but Mike Coughlan concluded "I don't think one strategy would have had a big difference over the other." The double rookie strategy at Marussia was a risky one, but so far in Australia, it has worked out okay. Qualifying was a baptism of fire for the two new drivers, and they qualified 19th and 20th, out in the first session, just as anticipated. All involved were reasonably satisfied with the result, considering the conditions. The race was a similar story. Max Chilton had a small collision with Giedo van der Garde in the Caterham, and had to pit for a new front wing. That put him on the back foot early in the race, and he's made a point of describing how quickly the stop put him in the "blue flag zone". Gradually he got to show what he could do, but Chilton was outshone by his teammate on Sunday. In the other car, Jules Bianchi put on an impressive performance to finish 15th, leaving the Caterham duo behind him, but unable to make up the difference to the Williams drivers in front. Considering the lack of time Bianchi had to prepare within the team, it was a great effort. If Marussia were happy with what they achieved over the weekend, that can only be because they were ahead of nearest rivals Caterham. Qualifying for Caterham was difficult, Pic lined up on the grid 22nd after mis-managing the tyres in the wet conditions. Giedo van der Garde outqualified his teammate on his first race, but was still disappointed with Saturday's work. The race went slightly better, marred by some technical difficulties. Van der Garde's car developed a puncture which meant his pit stop was brought forward earlier than planned. Pic was managing the tyres better, but then his car developed a KERS failure. With Marussia having KERS this year, there is no room for a failure on this front. The entire Caterham team will want to do much better at Malaysia, one of their home races.